This week, almost 100 school children from across East Anglia attended a FIRST® LEGO® League preview event at the University of Cambridge’s Department of Engineering, in preparation for the Cambridge regional tournament in January. Two workshop sessions were held for participating teams to provide them with the opportunity to see the robots in action, and discover the various challenges of the day. FIRST® LEGO® League is a global education initiative for students aged between 9 and 16, where teams of up to ten complete a series of robotics-themed challenges and build and program an autonomous robot, using a LEGO® Mindstorms® kit. Winners of the Cambridge regional tournament will be given the opportunity to progress to the UK and Ireland final in February, and then on to one of three international events, including the World Festival in Detroit, Michigan, April 24-27. As well as gaining a greater understanding of the logistics of the day, and which challenges we need to work on more before the tournament, the students are now raring to go in January! FIRST® LEGO® League is supported globally by Qualcomm Technologies International, Ltd. and its affiliates, with sponsorship that helps to fund participation. On a local level, this includes the provision of free LEGO® kits to eight sponsored teams in the county of Cambridgeshire. 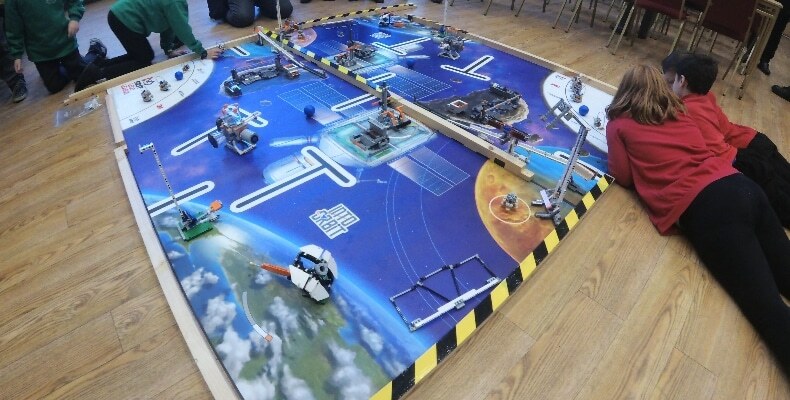 The Cambridge regional tournament will take place at the University of Cambridge’s Department of Engineering on Tuesday 15 January 2019. During the Cambridge tournament, Qualcomm Technologies International, Ltd. will bring a local team (based in Cambridge) to lend its engineering expertise, mentoring the teams of young people.